Glass chandeliers look beautiful anywhere in the house, even in the bedroom. In a normal home, we rarely see chandeliers in bedrooms, let alone glass chandeliers. In this list, we will be seeing the wonderful effects that glass can do to one’s bedroom. The spaces in here are mostly contemporary, designs where we’ll be seeing beautiful beds, stunning lighting and perfection in terms of decoration and themes. Below is a list of 20 Perfect-Looking Glass Chandelier in the Bedroom. These spaces are the prettiest and the most interesting bedrooms that you’ll be seeing for today not only because of the large and comfortable beds that the spaces have but also because of the gorgeous glass chandeliers that we do not really see every day but still enjoy seeing when we do. Sit back and relax and enjoy! This is one bedroom that somehow looks like it belongs to a guy because of the picture on the wall – of course, this could easily be a bedroom for a boyish girl but everything inside the space is definitely unisex. The colors are neat, the drapes are refreshing, the linens are easy in the eyes – this is one nice bedroom. This bedroom is almost an all-white bedroom; it looks really clean and neat but when you look at it, it’s not so heavenly or what – I have seen a lot of bedroom photos and there are really those bedrooms that makes you say ‘it’s heavenly’ more than others – but in general, this is one nice bedroom with nice things in it for the home owner to enjoy. The first bedroom in this list with the glass chandelier as the lights by the night stand and it sure looks stunning – the look and feel of this bedroom would surely pass for a hotel room. The dirty white walls, the mirrors and the white linens make this a rather pleasing bedroom to sleep in. Now the name of this bedroom is something that anyone would want – an ethereal slumber. Basically, after a day’s work, all we want to do is to really relax and maybe sleep the entire night and maybe have a glass of wine or two. Sleeping is not the only thing we can do in the bedroom, so adding seating and sometimes even a television is a nice thing that you can do for the bedroom and for yourself. Well, I have seen a lot of home design photos located in Noe Valley and honestly, they never fail to amaze me because of how well-thought each space is and how much love was used in them – seeing this bedroom and what’s inside it makes me want to really hit the bed right now; talk about inspiration! The ceiling work of this bedroom is really beautiful. I love it when the designer doesn’t forget to make each area in a home prettier and even functional. For one thing, we can admire the chandelier in any bedroom, but it would be so much better if we can admire the ceiling too – just like in this bedroom! Familiar with this bedroom? When I first saw this picture, I would like to believe that I have seen this one somewhere – but I can’t really be sure. The design of the chandelier looks interesting and it sure blends well with the color of the fireplace area and the ceiling. Why don’t you look at that stunning chandelier in the middle of the room; and then take a look at the lamps above the night stand! What do you think about them? Aren’t they just lovely and special to look at? They look like something you do not really see every day and it’s just really pretty. 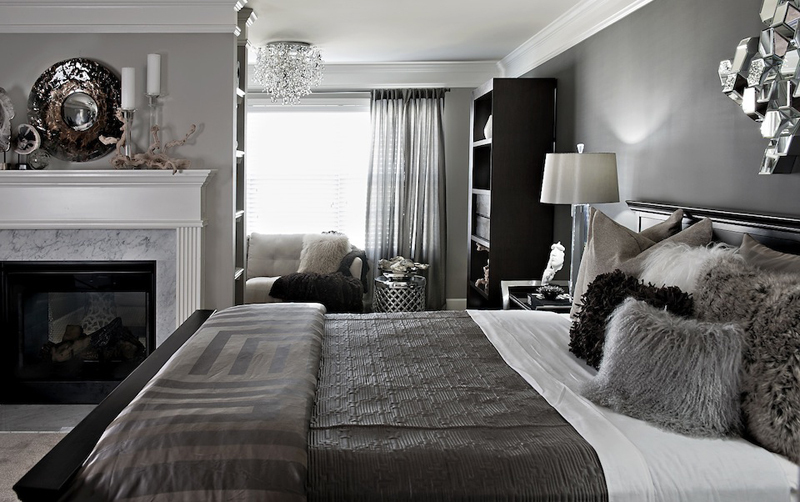 Talk about seeing things in black and white – this bedroom looks really stunning even in black and white. I can’t say what the exact colors are in this bedroom since I was not able to get the original photo of this bedroom, but when you look at it as it is, it sure looks perfect and really special. Here is one bedroom that will surely captivate anyone’s heart. I mean, come on, the color and designs of the fabric in here is just so perfect that I get reminded of Princess Jasmine; but take note, Jasmine’s outfits did not have purple in them! Look at the glass chandelier on the sides too; really pretty, right? How do you like the color combination of this bedroom? I personally love the linens in bed and the finish of the headboard. The purple and violets in this bedroom makes more regal as much as it is already captivating because of the black and white combination. 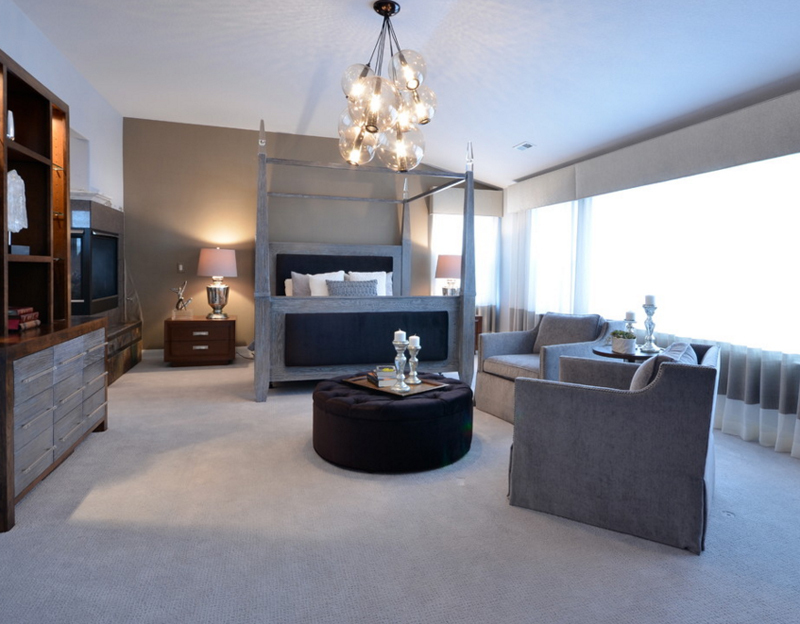 Take a look at the beautiful glass chandelier in this large bedroom! The way that the bed was placed in this space sure maximizes the use of the space without using too much decorations or materials to fill the room. Placing a bed diagonally is an unusual practice but seeing it here makes me actually like it. The charming glass chandeliers in this bedroom are definitely something worth being considered. Why use one chandelier when you can actually use two! 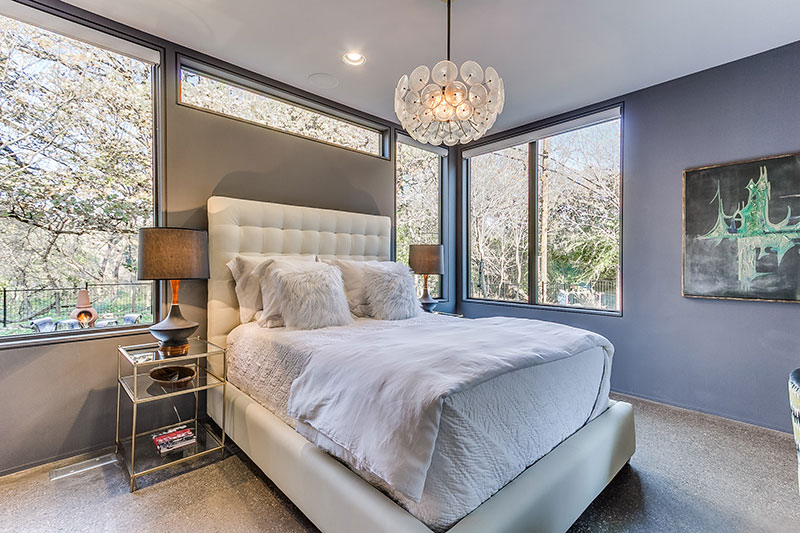 Designers practicing the use of chandeliers or pendant lamps as night stand lamps sure makes the bedrooms seem more sophisticated and definitely fascinating! This bedroom looks absolutely divine! The colors paired with white sure made it look really immaculate and heavenly. The glass chandelier may look simple and even small, but it sure completes the aura of this lovely bedroom. 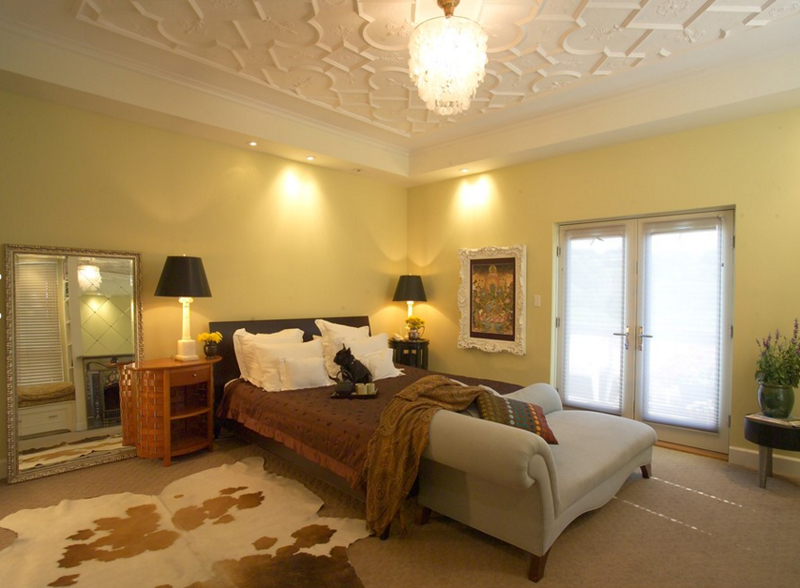 The dome of this bedroom creates a cathedral feel, and I think that the client sure loves it. The large bed in this stunning bedroom is definitely something that you’d look forward too every day after work – because not only is it large, but also very comfortable! The colors used in this bedroom is very common but very easy on the eyes; an ideal place really to rest and relax. The glass chandeliers used as the night stand lighting is quite fancy. This is one practice that designers and home owners are starting to like because of the idea that it adds glamour and fanciness to the bedroom. So, as a home owner, you can opt to use one beautiful chandelier in the center of the bedroom, or use two wonderfully chosen chandeliers as night stand pendants or chandeliers. This sure is one large master bedroom! 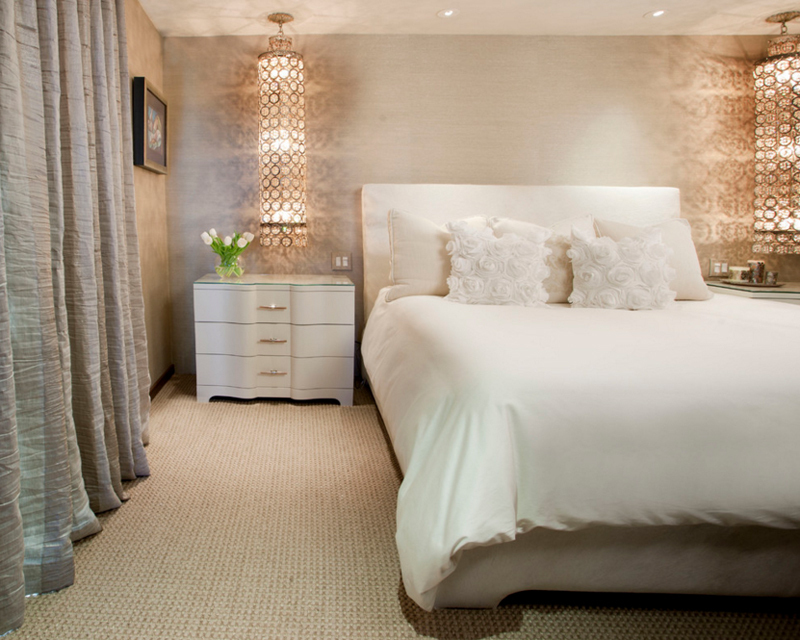 The white linens and paint used in here makes it more luxurious-looking and really captivating. 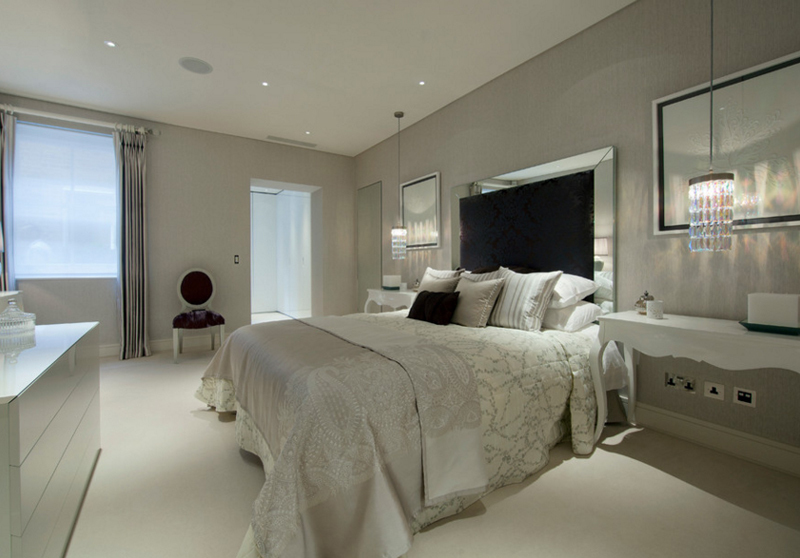 The use of fur and glass also added sophistication and class to this stunning master bedroom. This mid-century bedroom is quite a charming; the bed is large and looks really comfortable, the fact that this bedroom us surrounded by windows – it seems to be less private but because blinds are available, the issue on privacy is pretty much solved. Also, notice how beautiful the glass chandelier in here is. The chandelier in this bedroom is quite interesting – at this angle, you can barely see what the shape of the glass is; the crystal clear chandelier makes this small, charming bedroom more pleasant-looking and appealing to the eyes. Bedrooms with floor-to-ceiling curtains are really interesting because it makes the bedroom really look like a hotel or something. The design of this chandelier sure looks like a flower of some sort. The design is pretty cool for me – not only is it made of glass but it also goes well with the color and motif of this Spanish Oak bedroom. The details of the area carpet look great too! Don’t you think that was just fascinating? The list about the 20 Perfect-Looking Glass Chandelier in the Bedroom is very much like the Glass Chandeliers in 20 Appealing Dining Areas that are not only appealing or perfect-looking but they are all functional and very one-of-a-kind. The designs may somehow be common or something that you have already seen before, but I’m sure that they’re all worth the look and admiration that we give them.